Go into the dark Tunnel and break the walls with your Sword and proceed. The place inside looks awesome with great graphics. Here too, Prince move along the ledges, fight some bats, run through some weak wooden platforms and he then enters into a Big Caveran. 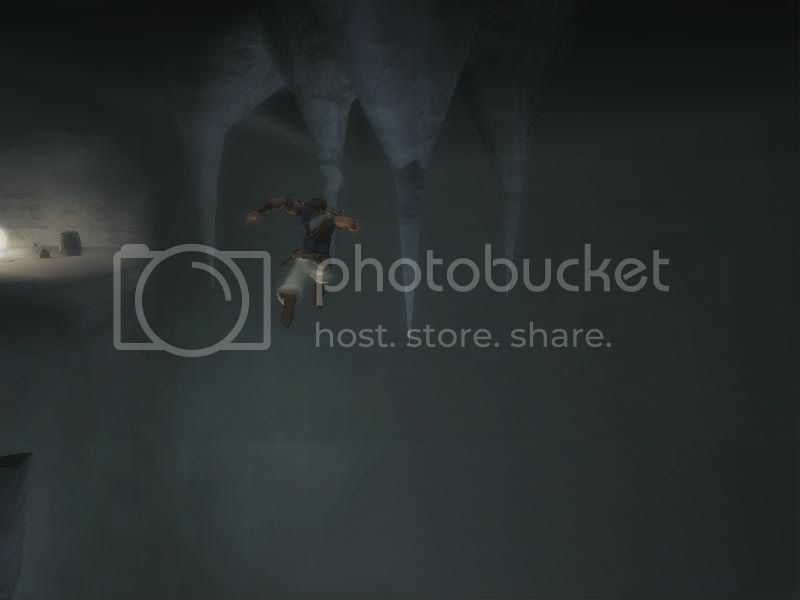 Before entering into the Caveran, the Prince jumps through many weak stalactites, which will break and leads to Prince's death if perfect timing is not maintained. In the Caveran, Prince has to go all the way down from the top, with the help of all the Ladders there. 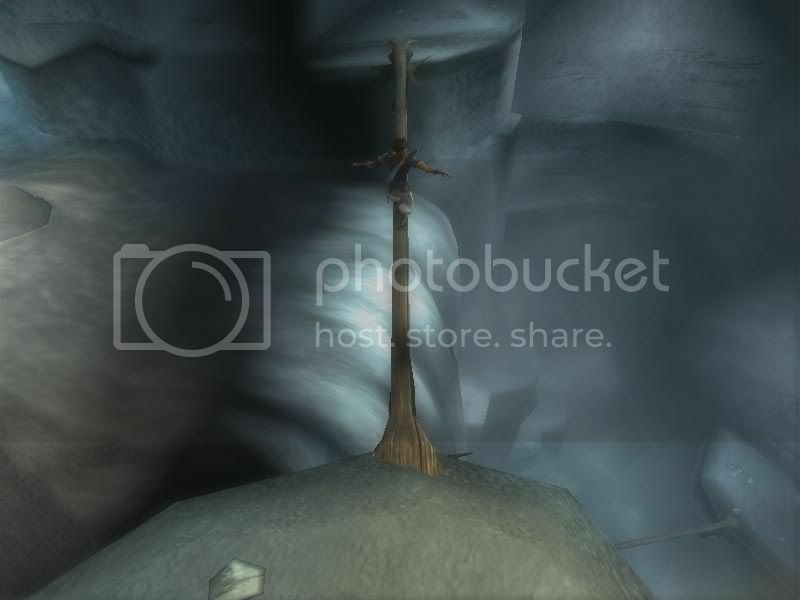 In this place, two Savepoints Waterfall and A Caveran of Ladders will be there and at the second Savepoint the Game Percentage Completion is 57%. I went to Saturas Place. There Riordian welcomed me and told me that Gorn was waiting for me and also he has a plan to recapture the free mine. Then I went and met Gorn. He is waiting for me on the way to Free Mine with some other Mercenaries. He told me that we must do a Stealth mission and capture the Free Mine. But, before going there, Gorn told me to go and meet Wolf in the new camp. I went back to the new camp and met wolf there. He told me about a completely new type of armor made of minecrawler's plates. To create one, he wanted me to get some hard minecrawler plates, which is the hardest material in the valley. He also taught me how to cut those hard plates from the minecrawlers. Then I went to the Free Mine with Gorn. In the free mine, I took the best two-handed sword, "Warrior's Voice", from Okyl's body. There, Jackal and other few guards were guarding the entrance to the free mine. I killed them and went into the New Mine. I went inside the closed gate of Old Mine, using the technique described in previous post. Then, I met Ian. He told me that there is a surprisingly large number of minecrawlers inside a cave and so he closed the gate to that cave. I told him to open that gate to search for the special secretion of Minecrawler mandibles, which car kolem told me. He told me, he cant because the gearwheel to open the gate is broken. So, I searched the gate and found a gearwheel near a masher. I took it to Ian and he told me that I can now open the gate by fixing the gearwheel and telling Asghan, the guardian of the gate, that "Everything's gonna be fine".This is a secret code between Ian and Asghan, which refers to the permission to open the gate by Ian. POP - SOT: "I'll Meet You at the Baths"
POP - SOT: "I'll Try to find a Way In"
POP - SOT: "Had I really seen her"
POP - SOT: "You have Unleashed The Sands of Time"